With both Firefly and Joy Ride finishing today, the prizes for Line Honours and Division 1 are sorted out. But the Overall Winner is still up for grabs. Turnagain, Salient and Kraken are sailing very hard to an expected finish around 6 am on Sunday morning - and not much is separating them. If they keep their speed up, they can finish ahead of Joy Ride on corrected time; so it is going to be an interesting 18 hours. At Roll Call, Salient had 151miles to the finish but was slightly in the lead, but coming in from the west on a hotter wind angle, potentially impacting their speed. A mere 10 miles behind is Kraken with Turnagain another 6 miles behind Kraken. But Turnagain has a longer water line and is moving about three-quarter of a knot faster. All 3 boats are forecast to finish within an hour of each other. Turnagain is pushing so hard, they even stored the fishing lines (but not before catching a small marlin). 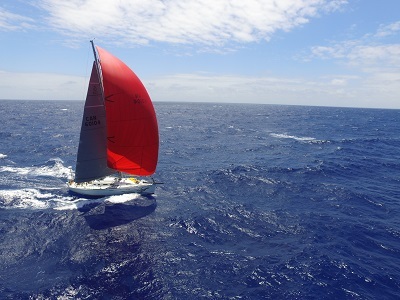 With winds staying above 20 kts and huge seas, things are starting to break. But that is only a concern to the boats as they figure out how fast it can be fixed or jury-rigged. Anjo and Oxomoxo are sailing hard as well, with Serenite keeping pace. Anjo is 155 miles behind Salient, Oxomoxo 219, and Serenite 207 miles. All three are forecast to finish on Monday.